Get a signed hardcover copy! Register to get the latest on upcoming events, expeditions, and running camps. 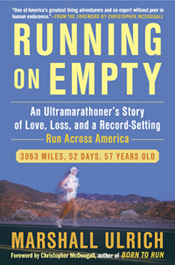 The author of Running on Empty, Marshall Ulrich is a versatile, world-class extreme endurance athlete: an ultrarunning icon, Seven Summits mountaineer, and competitive adventure racer. His prolific athletic career has earned him numerous wins, records, and firsts on some of the toughest courses in the world and taken him to the top of the highest mountains on every continent—all in his forties and fifties. 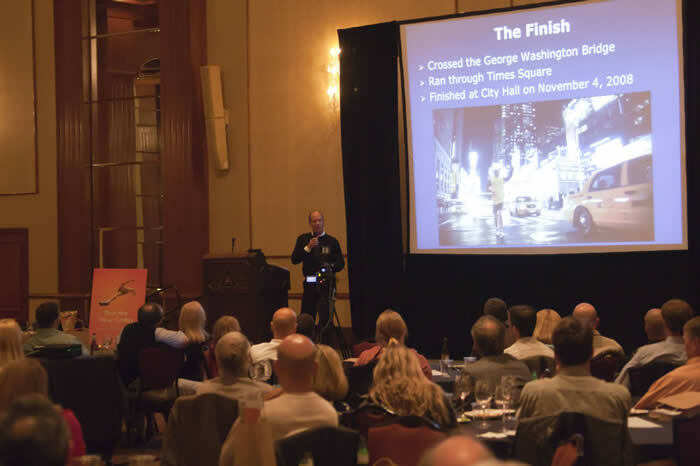 Revered among athletes, Marshall Ulrich is also an acclaimed speaker for conventions, corporate events, and university programs. He has presented at national conferences across the United States and is a Toastmaster and a member of the National Speakers Association. Discover what you’re made of! or you can e-mail Marshall directly at catchmarsh@marshallulrich.com. Running on Empty. In 2008 at the age of 57, Marshall Ulrich ran across the United States, completing the mind-bending and body-breaking equivalent of 117 back-to-back marathons in 52.5 days, running an average of more than 400 miles a week. Marshall’s Running on Empty speaking message and the metaphor of the run are universal, whether you’re an athlete or not. It’s about facing forward and taking the next step. It’s about not flinching when the road gets rough or you miss a turn, and about finding another way when the bridge you planned to cross has collapsed. It’s about goal setting and doing what you say you’ll do and not letting anything or anyone stop your progress. Ultimately, it’s about facing the toughest challenges, enduring crushing setbacks, accepting friendship and love, and finding fulfillment. Everest as a Model for Your Success. Learn to manage your life more effectively: Successful businessman, ultrarunner, adventurer, and Seven Summits mountaineer Marshall Ulrich uses his climb of Mount Everest as a model to show you how to earn the results you desire. He speaks about the need for enduring values, gaining the skills required for success, team building, managing change, and following through on the execution of your plan. Visually exciting and relevant to any business or university group, this presentation excites audiences and inspires them to climb higher in their own lives. Preparing for Adventure—A Guide to Training, Hydration, and Nutrition. World-class athlete Marshall Ulrich presents his insights on training, hydration, and nutrition for outdoor activities and sports, including managing extreme environments such as heat, cold, and altitude. He talks about the importance of “real food” versus specially engineered or processed foodstuffs. These guidelines benefit the weekend warrior, avid outdoorsman, or competitive athlete. His insights are based on a decades-long career completing the Triple Crown of Extreme Sports: ultrarunning, adventure racing, and mountaineering. Appearance on Discovery Channel's "Daily Planet"
See the most recent news items on the Media page.